Black holes temperature of stars - Solar System Planets And Moons Section. Detect black holes and measure the temperature of stars. 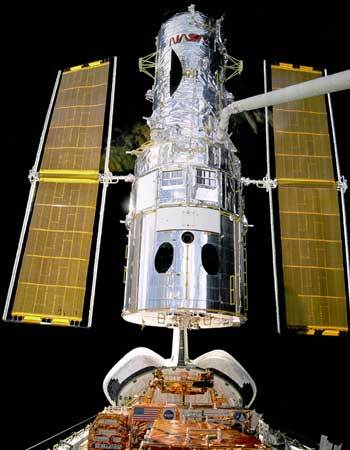 Hubble Space Telescope Instrument Fails. NASA announced on Friday that one of Hubble's four science instruments has failed, and they're not sure if they can get it working again. The instrument is called the Space telescope Imaging Spectrograph (STIS), and it's designed to detect black holes and measure the temperature of stars. Engineers think that its backup power converter has failed; unfortunately, it already lost its primary power converter almost three years ago. The STIS was installed during a servicing mission in 1997, and it's already exceeded its planned lifespan of 5 years. NASA's Robonaut Can Move Around Now. NASA is working on a human-like robot called "Robonaut" to assist astronauts with the maintenance of the International Space Station. It's still a long way off before the robot joins the astronauts in space, but things are developing well. This week the robot got a "space leg" so that it can move itself around a simulated version of the station. Another test put it onto a modified Segway scooter so that it could wheel around the lab. The robot is controlled through "telepresence", where commands from a human controller are transmitted to the robot wirelessly. Envisat Observation Satellite Sees the Earth Changing in Real Time. Detailed Picture of Stormy Saturn. This detailed picture of Saturn's stormy atmosphere was taken on July 13 by NASA's Cassini spacecraft, when it was 5.1 million km (3.2 million miles) away from the planet. It was taken using Cassini's narrow angle camera using a filter sensitive to wavelengths of Infrared light.